I just came back from a quick weekend trip to Las Vegas and the Death Valley National Park and while I was in Vegas, I finally got to visit the Neon Museum. I actually used to live in Vegas back in early 2000s and I never knew this place existed. Apparently they've been around since 1996. 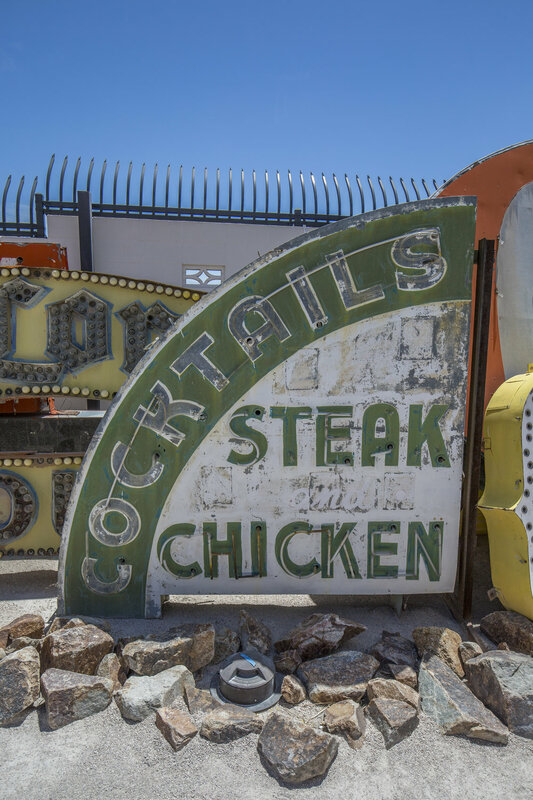 For those of you who don't know, the Neon Museum is a non-profit organization which collects, restores and preserves old Las Vegas signs, not necessarily just neon signs, but any sort of historic and iconic signs or sculptures. During our guided tour, I wasn't allowed to take videos and I was busy taking pictures so I don't remember everything the guide lady told me, but I did some more research when I came back home and got to learn more about the signs. So when you get to the museum, you’ll see the neon sign, of the Neon Museum by the parking lot. The sign is actually a collage of different elements from different Vegas signs. The top N is from the Golden Nugget, the E is from Caesar’s Palace, the O I believe is from Binion’s, and the second N is from Desert Inn. The top star on the right is from the “Welcome to Fabulous Las Vegas” sign, and the smaller starts are from Stardust. One of the first signs that you’ll see as you walk in is Jerry’s. It is from Jerry’s Nugget Casino which was opened in 1964 and it is still open I believe, and this particular sign was made sometime in the 70s. This sign was actually a circling piece on top of a tower of letters that spelled “nugget.” In 2014, the sign was restored and donated to the museum by the casino founder, Angelo Stamis in honor of the casino’s 50th anniversary. This piece, which is not exactly a sign, is from Golden Nugget Gambling Hall. Although it says 1905, the Golden Nugget first opened in 1946 which still makes it one of the oldest casinos in the city. Gambling actually wasn’t legal in Las Vegas until 1931. If you google Golden Nugget, you can easily find old pictures of the building and how these pieces were arranged. The Moulin Rouge hotel, obviously named after the Paris nightclub, first opened in 1955 in a predominantly black neighborhood, and it was actually the first desegregated hotel casino in the city. It became obviously popular with many A-list black entertainers, who would perform at other hotels and stay at the Moulin Rouge. The hotel unfortunately closed down only 6 months after opening, but in the 1960s it played a huge role in the Civil Rights Movement. A lot of the regular visitors and former employees of the hotel became activists and supporters of the movement, and eventually forced all casinos on the strip to be desegregated. There has been several incidents of fire on the property in the recent years and the sign has been moved to the museum around 2009. The El Cortez Hotel and Casino opened as the first downtown Las Vegas resort in 1941 and it is still open, which makes it the oldest continuously-operating hotel and casino in Las Vegas. I think I actually parked there last time I went to downtown. The hotel’s exterior is still mostly original and it is also the only casino in town on the National Register of Historic Places, so it's a great place to visit to experience a piece of old Las Vegas. Binions is an interesting hotel. Its founder, Benny Binion was a gambler at heart. Since they first opened on 1951, their focus was on gambling, not on performances. It became famous with high-limit, or sometimes unlimited craps tables and hosting of World Series of Poker, the biggest poker tournaments in the world. The casino was renamed to Binion's Gambling Hall and Hotel in 2004, and although the casino is still open today, the hotel was closed down in 2009 due to high renovation cost and recession. One of the coolest signs that wasn't from a strip casino. Targeting the rising middle class vacationers after the World War II, a lot of motels were built around the Route 66 and Highway 91 including the Yucca Motel, which borrowed its theme from its surrounding landscape. The motel was closed down in 2011 and the sign was moved to the museum in 2014. 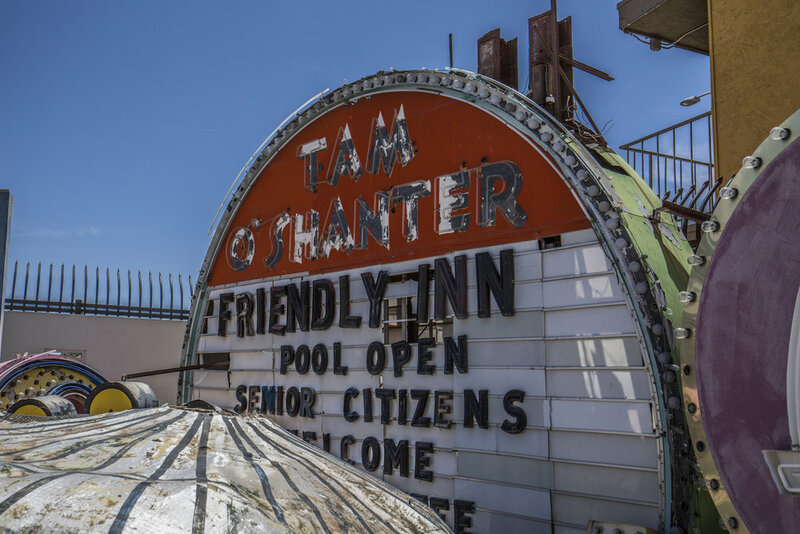 For those of you who don’t know, "Tam O’Shanter Inn" is actually a restaurant in Los Angeles. It is one of the oldest restaurants in LA, established in 1922, but from what I understand, they are not related. According to the Neon Museum’s Facebook post, the motel in Vegas first opened in the late 50s and it was named after a golf course in Chicago that the owner frequented. The motel was closed down in 2004 when the property was sold to the owners of the Venetian hotel for over $12 million, and The Palazzo building was built on the spot where the motel was. This is the oldest sign at the Neon Museum and probably my favorite. Mattie “Jimmie” Jones began selling fried chicken and bootleg whiskey from her kitchen window to the travelers, and in the early 1930s, she opened her restaurant, the Green Shack, which then became one of the longest running restaurants in Las Vegas. Since prohibition wasn't lifted until 1933, it is very unlikely that any restaurants would have had signages with "cocktails" written on them until 1934. The Green Shack was eventually closed down in 1990s. An interesting fact that I learned, was that the film Casino was actually based on the true events that happened at the Stardust hotel, but when the movie was being made, Stardust was still open so they had to change the name of the hotel in the movie to "Tangiers Hotel and Casino." Although I've never been inside the Sahara, I've always had a soft spot for the hotel because I saw this sign almost every day on my way to school when I lived in Vegas. Apparently this is a replica of the sign because the real sign was too big for the museum. The hotel was closed down in 2011. 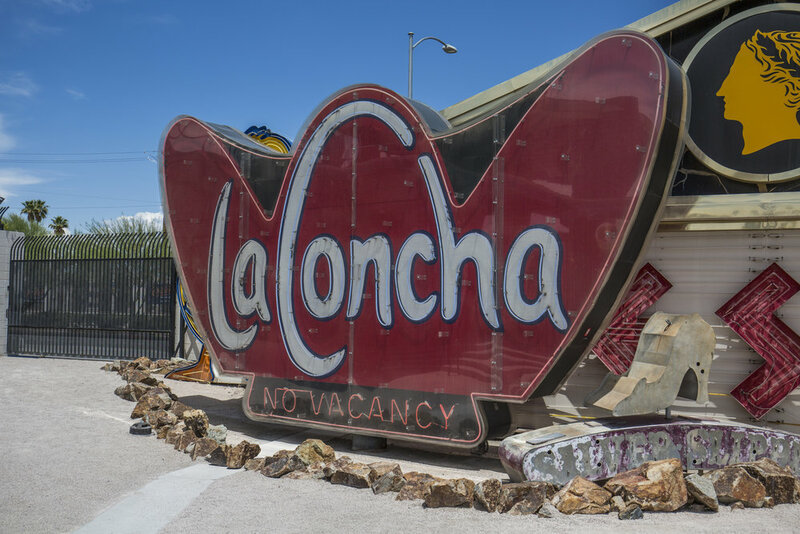 La Concha Motel first opened in 1961, next to the Riviera Hotel and Casino on the Strip. It was closed down in 2003, and the lobby was moved north Las Vegas Boulevard in 2006 and it now stands as the Neon Museum's visitor center. I unfortunately don't have the photo of the lobby, but if you ever get to see it in person, the shape of the sign will make much more sense. I must say, this was a fascinating experience and it was well worth the $19 I paid for the visit in my opinion. Even after reading this, I highly recommend visiting the museum. Like I said, these are only a fraction of the signs from the Museum and it's good to know that the money is going to be used to preserve the signs and also for them to acquire more cool signs in the future.